Researchers examining Saint Rose of Viterbo's mummified body have concluded that she died of a heart condition, rather than tuberculosis, as had previously been thought. (June 12) -- The miracles performed by Rose of Viterbo are well known to many Catholics. Legend has it the 13th-century Italian saint stood for hours on a raging pyre without being burned (a useful skill if you want to impress and convert pagans) and could foretell events. But exactly how this godly young prodigy died in 1252 at the age of just 18 or 19 -- some historical records suggest she succumbed to tuberculosis -- has never been clear. Now, more than seven centuries later, a team of Italian scientists has succeeded in pinpointing the likely cause of death as a blockage of the heart, a discovery detailed in The Lancet. The team took X-rays and photos of the holy woman's heart, which on later study "revealed the presence of a particular defect, a mass, that we think was the cause of death," D'Anastasio told LiveScience. That blockage is believed to be an embolism, a blood clot from another part of the body that became lodged in her heart. This surprise diagnosis was only possible because of the unique way Rose's body had been interred back in the 13th century. Realizing that Rose was destined for sainthood, the medieval monks placed her corpse in a sealed glass casket. That kept moisture and oxygen away from the body, slowly turning it into a "well-preserved ... natural mummy," D'Anastasio said. Oetzi the Iceman Died: Around 3300 B.C. Cause of death: When Mr. Iceman's body was discovered on the slopes of Austria and Italy's alpine border in 1991 -- where it had been naturally mummified in the ice -- scientists believed that the Copper Age man had frozen to death during a winter storm. Ten years later, though, a stone arrowhead was found embedded in his left shoulder, causing experts to think poor Oetzi had been hunted down and killed. However, researchers now believe that injury would only have caused the iceman to pass out from loss of blood. According to the latest findings, Oetzi was actually finished off by someone smashing in his skull with a rock as he lay unconscious. 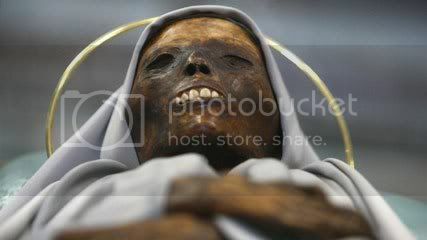 Tutankhamun Died: Around 1323 B.C. Cause of death: Since the Egyptian boy king was dug up by British archaeologist Howard Carter in 1922, dozens of theories have been advanced about what did him in. Some experts said he perished plummeting from his chariot, others that an assassin had brained him. But after two years spent studying his DNA and remains, Egyptian scientists now believe the 19-year-old died of malaria, although his body had also been weakened by a rare bone disorder. Ivan the Terrible Died: A.D. 1584 Cause of death: Foul play has long been suspected in the death of Russia's original bad boy, who slaughtered tens of thousands of his subjects and beat his own son to death in a rage. Tests carried out on the czar's corpse in 2002 indicated he might well have been murdered: His body contained more than enough mercury and arsenic to kill a man. Of course, it's also possible his death was simply caused by medical treatments gone wrong. Mercury was often used to treat syphilis (and Ivan was notoriously promiscuous), and arsenic was taken to fight the plague, which ravaged Russia throughout his rule. Slow poisoning by mercury, known to cause sudden mood changes and madness, might also explain why Ivan was so, well, terrible. Zachary Taylor Died: 1850 Cause of death: The passing of America's 12th president is surrounded in mystery. Rival pathologists have claimed he suffered a fatal case of gastroenteritis after stuffing his face with iced cherries and milk, or died from organ failure triggered by heat stroke. But one historian, Clara Rising, believed Taylor was murdered for opposing the expansion of slavery to the American Southwest. In 1991 she paid $1,200 to have his tomb cracked opened and his remains subjected to chemical analysis. The results came back negative, and the true cause of death was never firmly established. On the upside: Abe Lincoln got to keep his hard-won title as the country's first assassinated president. Bill Clinton would hit on either one. Just adding to the catalog, not sending a general distribution.